Many experienced webmasters are usually doing keyword research before releasing a website in the wild, but what if someone already created a website and launched it without an initial analyze on potential keywords that can bring him the most desired traffic ? In this article I will show you two great methods for discovering keywords that bring traffic to a website, methods that beginners might not be so familiarised with. And all this with 2 free tools : Alexa and Awstats. We should probably start with Alexa while lately it has a lot of sympathies among webmasters, and the website analyzed will be www.temi.co.uk. In order to have a good kick-off, it would be better to install Alexa toolbar for a better reach to its statistics about a certain website. 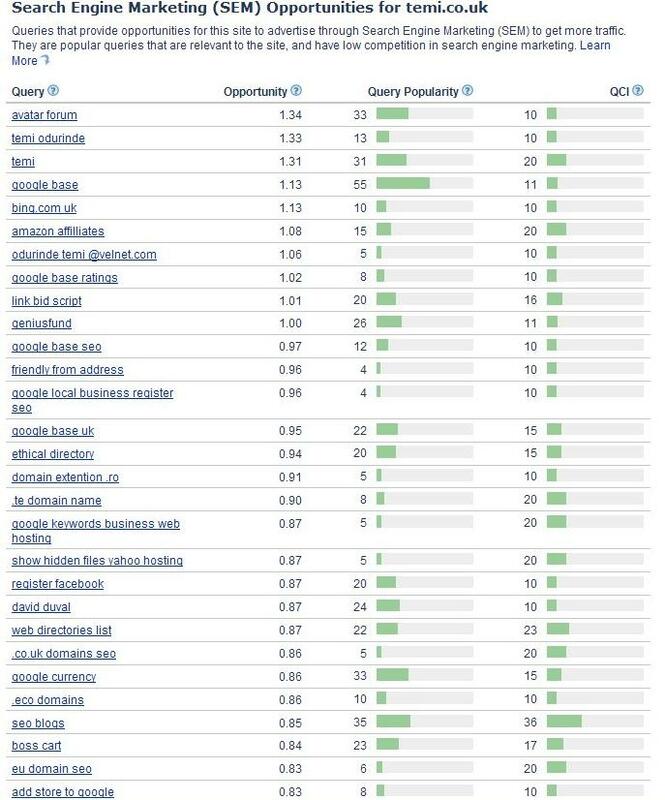 Once you head to Alexa website, click on « Search analytics », there you will have lots of details about the percentage of site traffic, top queries from search engines etc, but what we are really interested about are the « High Impact Search Queries » and « SEM Opportunities » sections. In the High Impact Search Queries section, we see the popular queries that are important for this site, with keywords and phrases you probably have not been aware of, until now. What we would want to target are the keyphrases with a high query popularity and lower QCI, or query competition index. In our case, a good example would be « web hosting blog » while it already brings some traffic, it has a good popularity and the competition is somewhere at medium. On the other hand, if you are to setup a PPC campaign, a good indicator is the SEM opportunities table where, same as the above one, you will find queries with good popularity, low-medium competition and, in « Opportunity » tab those numbers will indicate how lower/higher will be the CPC for a certain keyphrase. Of course Alexa provides much more detailed information when you click on a specific keyword, but about that we will talk in a further post. So we learned a little about the opportunity that Alexa features for webmasters, now let’s jump to Awstats, and the website analyzed here will be www.maliburum.org . Go to your cPanel from the hosting plan provider, and there, depending on the provider, you will have access to different logs, from bandwidth and error logs to Awstats, a tool that provide comprehensive web, mail and ftp statistics, for free. Along with different interesting information like unique visitors, visitors/day, country where they came from and so on, scroll down until you reach « search keyphrases » table. What we are interested about is actually the full list of those 806 different keyphrases that bring visitors to our website. For obvious reasons, there is only a slight part of the table, while it could not fit in this post. From this point, the possibilities are endless : whether you choose a keyphrase and see the amount of traffic that could bring you if properly optimised (you can use Google Keywords Tool for an approximate number of searches/month) or you pick one by one and start optimising its, this is a potential goldmine for someone that did not have a clue about keywords research before launching the website. A more efficient method would be to mix the statistics from Alexa and Awstats and do an analyze on the results, you would probably have some more interesting keyphrases to concentrate on.